【SIMPLE ELLIPTICAL STRUCTURE】Metal and high quality plastics make it steady without vibrating sound. 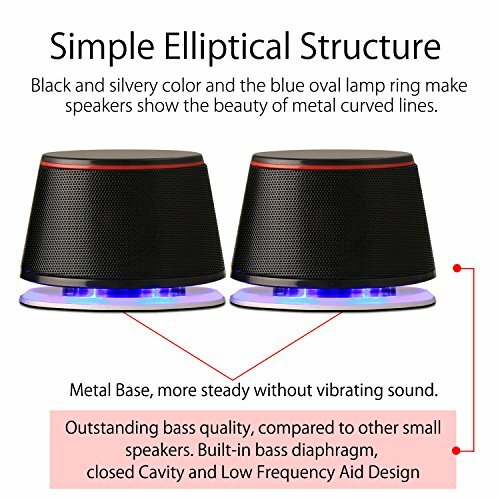 Black and silvery color and the blue oval lamp ring make speakers show the beauty of metal curved lines. 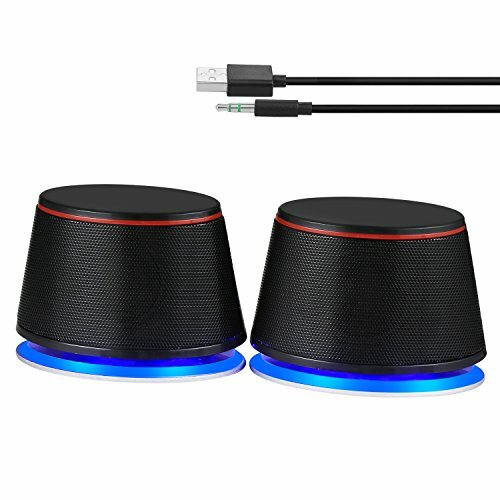 Adopted the low-voltage digital power, the maximum power can be 5W x 2, ensure the sound clear, bright, rounded and thick. 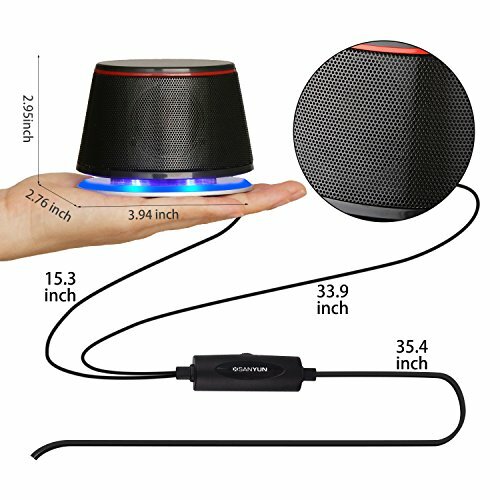 Small Body(3.94×2.76.2.95inch) with powerful audio. 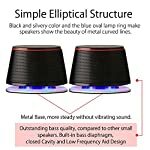 【SUPERB SOUND QUALITY】Outstanding bass quality, compared to other small speakers. Built-in bass diaphragm, closed Cavity and Low Frequency Aid Design to provide strong bass performance. 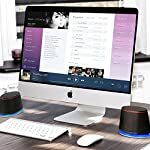 In order to make up for the lack of bass of the Mini 2.0 speakers, the unique acoustic resonator structure using the enclosed low-frequency aid design makes the sound more penetrating and powerful. Note: Restricted to the small volume, bass effect still can’t compare with big speakers and professional subwoofer. If you’re looking for a pair of speakers which has acoustic quality stereo sound, small size and not taking too much space on your desk and easy to carry. 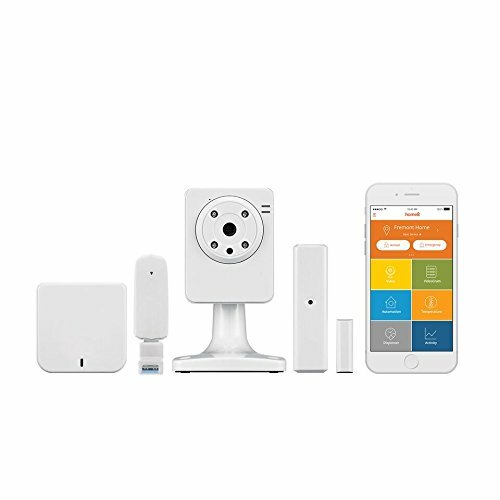 Sanyun SW102 will absolutely will be your best choice. 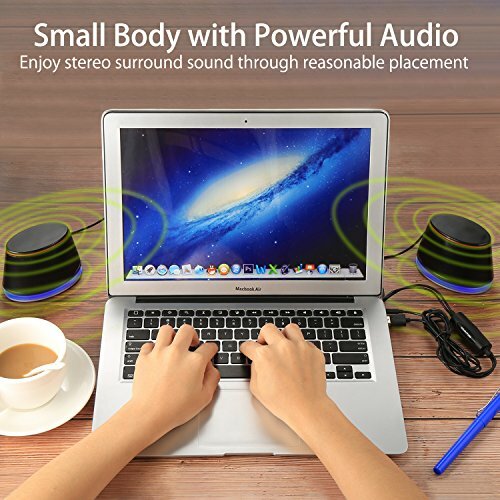 Note: USB and 3.5mm Jack both need to be plugged to get the speakers work. 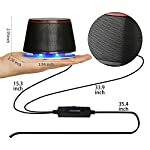 The current needs to be guaranteed between 400mA and 5A and the voltage needs to be guaranteed between 4v and 5.5A to get the best sound. If the current and the voltage beyond the range, the sound may be distorted. 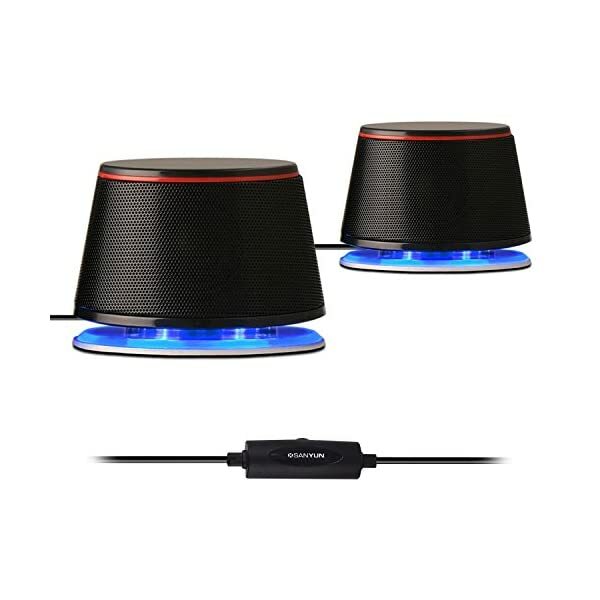 Sanyun, dedicated to create the best speakers, to provide the best sound enjoyment. 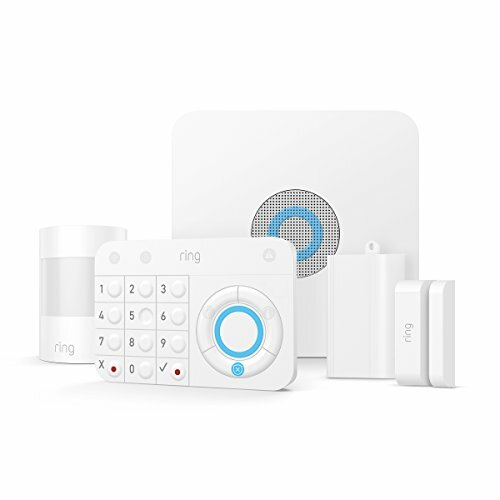 Any advice and suggestion for our product, please feel free to advise us. Your encouragement will be our greatest motivation. 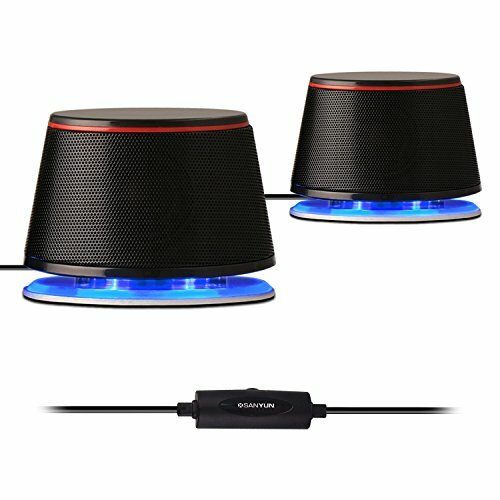 【360 DEGREE STEREO SOUND】2.0 Channel stereo speakers, enjoy the best stereo effect need to separate 2 speakers, for example, the two speakers are separated from the distance of 1 meter, the two speakers and people should be 1 meters distance, then the two speakers and people is an equilateral triangle, such a position, you will hear the best stereo effect. 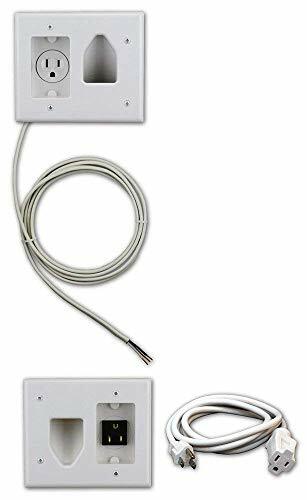 【WIDE APPLICABILITY】High quality cable and independent drive-by-wire design, stable sound transmission and convenient control. 3.5mm audio interface, suitable for most music players, iPhone, iPad, Samsung Galaxy phone or tablet, MP3 player or other device, just plug into your device to listen to your music at full volume. 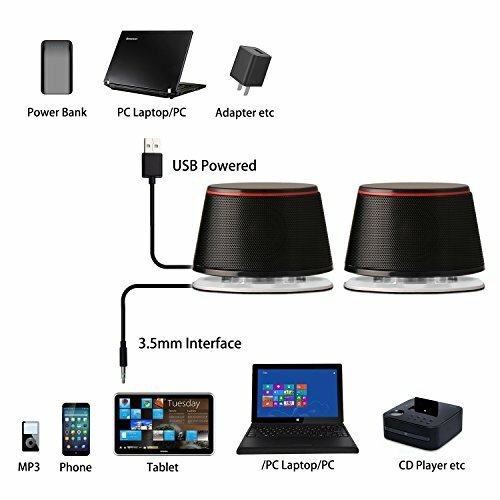 USB power supply, can be directly plugged into the computer USB port to take power, can also connect most of the 5V charger power supply. 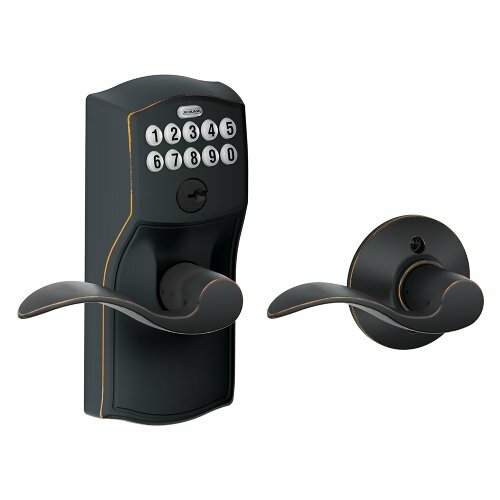 【3 YEARS WARRANTY, PLUG AND PLAY】3-Years Manufacturer’s Warranty and Unconditional 30 days Money-back Guarantee. 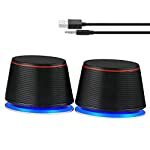 Simple operation, just plug the USB cable into your device or the charger and plug the 3.5mm jack into your audio device, the Sanyun speakers will fill the room with your music, movies or games; independent wire control design, more convenient to use.